Each Heat Line model is compatible with all types of household heating system, including heat pump, boiler, geothermal and solar. It also uses your house's existing heating system, which sees little use over the summer, or renewable energy. The Heat Line pool exchanger is easy to install and has several configurations in order to adapt to all types of installation. 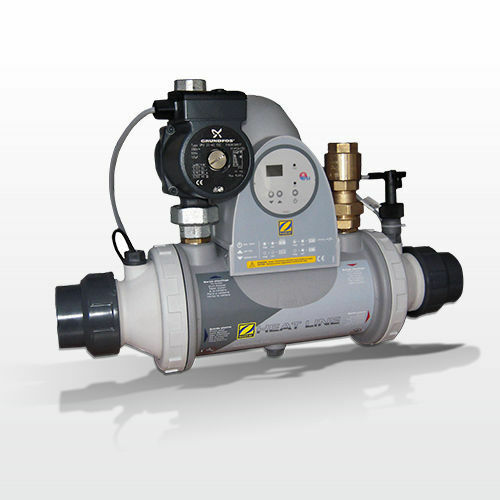 It is available as a bare-bones model, with no circulator, so that you can better personalise it with your pool equipment and adapt it completely to your installation. It is installed in the service compartment, adjacent to the boiler and at the exit of the filtration unit, without bypass. Temperature control is done via a 'precision' thermostat with a digital display. It offers maximum toughness, with titanium plates and a Noryl/polyamide housing.